Scarlet Jacobs is cursed to die and come back to life over and over again—sometimes skipping years, other times skipping centuries—all because she carries part of the immortal blood of another. But this time it's different. When Scarlet died pierced by the arrow, she came back to life minutes later still in the present. This can only mean one thing, the curse is changing. Suddenly her connection to Tristan amplifies, so much that now she can feel his pain when they're not together. The race to find the Fountain of Youth becomes deadlier than ever, with Ashmen attacking, and the inevitable death of Scarlet, or possibly Tristan. 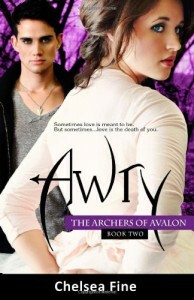 Be prepared because Chelsea Fine's Awry will give your heart a serious workout in this second installment of The Archers of Avalon. Love, betrayal, curses, heartache! This time we get to read about Scarlet and the Archer boy's past in interlacing chapters. Scarlet and Tristan's first encounter, Gabriel's first love, the curse!! !...I have never wanted to read flashbacks so bad in my life. Let me tell you, Scarlet was even more badass then than she is in the present! And it's who she can be again once she gets her memories back. It just made me love Scar even more. That being said, my freaking heart was breaking with their past story. Now I knew the real depth of their feelings for each other, and reading the present story and how badly the curse had messed everything up made me want to cry. The curse is seriously messed up, but people…this is how I like love triangles. Cursed and deadly. The Archer boys were their amazing selves once again. Tristan was just flawless, and I mean flawless. I could feel his love for Scarlet emanating from the pages. All that he did for her in their past life, and his patience and unfaltering love for her in the present is admirable. I still wasn't in love with Gabriel being with Scarlet because of the curse, especially when he got all overprotective and stuff. But I did like when he accepted Scarlet wishes and backed off. Regardless of which Archer brother you end up loving, there only one thing to say, and that is that Scarlet is one lucky girl! The plot was fast-paced, intriguing, action packed, and full of humor! The supporting characters were once again a blast. Heather still has the best one-liners ever, and Nate isn't far behind with his nerdom exploding at the weirdest moments. I loved that these two got bigger parts this time around. Only think that irked me was why they didn't search Laura's place early. It seemed like they just kept putting it off for no reason, or forgetting about it. The last chapters flew by! When my Kindle marked 98% I wanted to scream, and holy crap, that was a badass ending! I liked Anew, but I LOVED Awry. PS: What's this?! Avow comes out Dec. 2012!? Please tell me that's not an error!